In 2015, Stone & Wood decided to start paying tribute to the people without whom the local beer landscape would look very little like it does today. They did so by inviting Phil Sexton, a founder of the Sail & Anchor, Matilda Bay and Little Creatures (and much else besides) to brew with them. 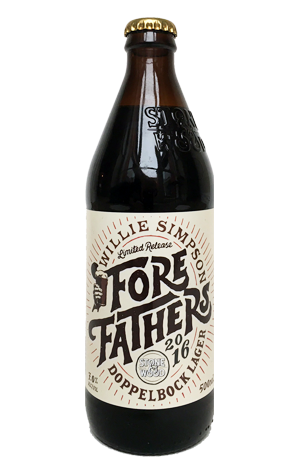 And now, for their second Forefathers release, they invited Willie Simpson up from Tasmania to join them at the brewery. For those who've not heard of Willie, he's a guy who, for some reason even he probably doesn't fully understand, decided to write about the Australian beer industry when there wasn't an awful lot of obvious interest or excitement to write about. For more than a quarter century, he wrote books and articles, including a long-running series in the Sydney Morning Herald, that helped give those interested in beer beyond the mere quaffing of lagers something to explore, and also lent the industry a form of legitimacy. A few years ago, as the newspaper's interest in covering beer seemed to be waning in inverse proportion to the amount of fascinating things that warranted covering, he put down his pen for the last time to instead focus all of his attention on the Seven Sheds Brewery & Hop Farm he and partner Catherine Stark operate in Railton, in northwest Tasmania. There, alongside a series of brewers he's helped train, he produces a range of alternately traditional and uniquely fascinating beers, many of them used to highlight small local producers. For his Forefathers brew, he and Stone & Wood head brewer Brad Rogers opted for a German style doppelbock, a form of strong, dark lager. A figgy fruitiness hits first, followed by chocolate fudge and cocoa, with a touch of nuttiness appearing on the palate too. At 7 percent ABV, there's a creaminess to its dark brown body as well as hints of sweet booze. It's not a style you see often here (presumably part of the reason behind brewing one) but you might wonder why after trying this, with the cocoa and balancing hops providing a drying finish. Find out more on the collaboration here.